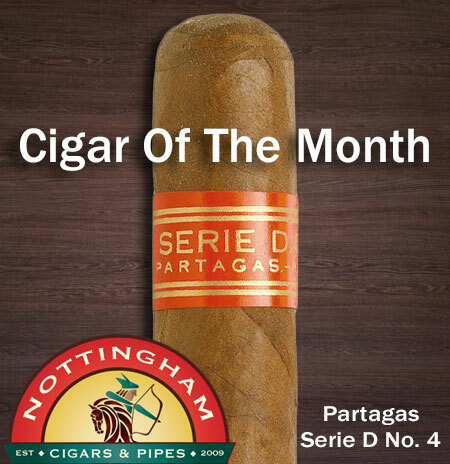 Our Cigar of the month for February is the ever popular Habanos in a Robusto size PARTAGAS SERIE D No. 4 ( 4 7/8 X 50) HR. This Cigar is a perfect smoke for the Canadian winter weather. The Partagas Serie D No. 4 has a reputation for being one of the best Robustos in the world. If you ask any seasoned Cigar smoker which Robusto sized Cigar they think is the best ever produced, most would probably say the Partagás Serie D No. 4. One of my personal favourite Cigars as well. This Partagas Cigar has Flawless construction, is very well rolled, burns evenly and gives as much smoke as you need with a draw that is fairly easy. In recent years, the Serie D No. 4 , one of the formats of the brand, has perhaps been its most valued vitola by many experienced smokers. Its flavour is immediately recognized by the nature of its blend, made up by tobacco leaves selected from the Vuelta Abajo zone. A Partagas is immediately recognisable by its deep, earthy flavour. The character of its blend springs from a selection of filler and binder tobaccos grown in the Vuelta Abajo zone and chosen for their unmistakable richness of flavour and aroma. But perhaps the best known of all Partagas is the Serie D No. 4, the robusto size that formed part of the legendary Partagas alphabet series that dates back to the 1930’s.